At the very end of 2011 I found myself camped in Yosemite Valley. One morning I forced myself out of my warm sleeping bag only to see a lovely pink glow already filling the sky. The color quickly faded, but the sky remained full of wispy clouds. 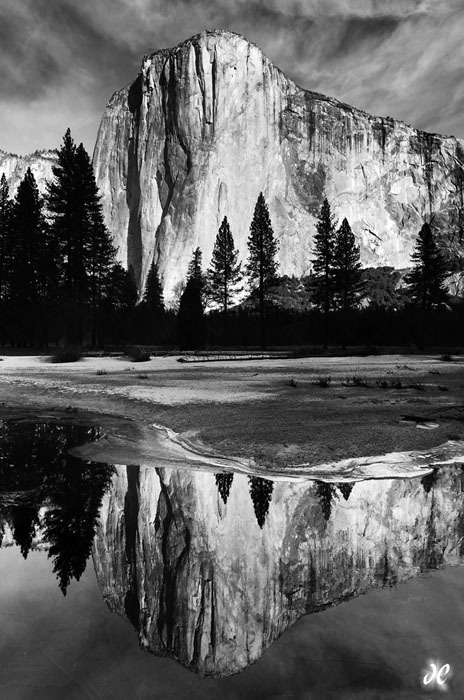 Making my way to the Merced, I found a bend in the river where a near-perfect reflection of El Capitan filled the icy waters. Stamping my feet and flexing my fingers to ward off the cold, I waited for the sunlight to make its way down El Cap’s bulk, and then I snapped this shot.